Popcorn is the greatest snack ever. It's been the part of our lives for such a long time that we can't imagine watching movies without it. Celebrate National Popcorn Day on January 19. The oldest popcorn ears were found in New Mexico and they are dated to be more that 5,600 years old. Food scientists assume that the first popcorn was made by throwing kernels on sizzling hot stones over the campfire. The corn popped, but it wasn't eaten as a snack. The popped corn was pounded into powder and then mixed with water. The early Colonists began adding milk to ground popcorn and ate it for breakfast as a kind of cereal. The popcorn we know appeared during the 18th century. While Felix de Azara was exploring Paraguay, he was told about a kind of popcorn kernels, whose grains burst without being detached. He tried those burst grains and found them very good. That was the moment when the right corn for popcorn snack was found. And with the invention of popcorn machine the world craze over this snack began. 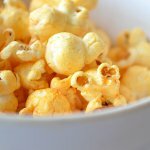 Celebrate National Popcorn Day with a bowl of your favorite sweet, spiced or salted popcorn that you can make in your microwave oven in a few seconds.